Attention all beautiful tropical fish and poetic, noble land mermaids! ATX Season 6 is going full on Pawnee! 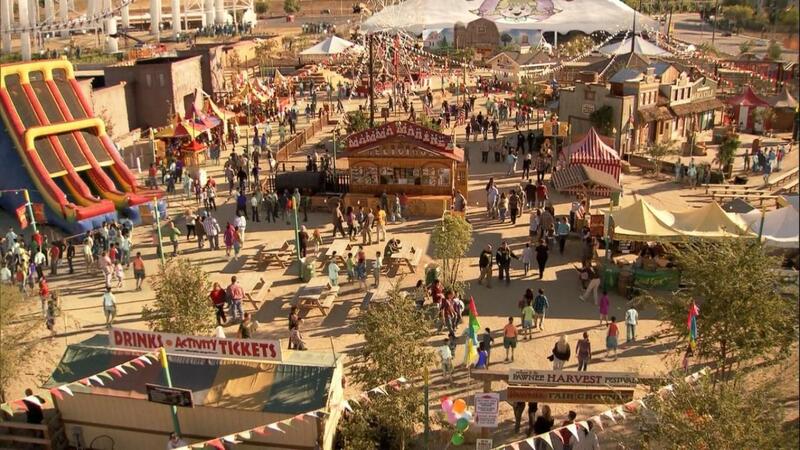 Join us for an evening of awesome music, Harvest Festival themed activities, delicious food and drink, a Smallest Park in Texas photo op, and a screening of 2 episodes of Parks & Recreation. And also, possibly, the best thing to potentially ever happen to anyone, anywhere, in the history of the universe - ladies and gentleman, there will be a Li'l Sebastian will be in attendance. The ATX Parks & Recreation Outdoor Screening is part of the annual ATX Television Festival, a four-day event that celebrates the television medium: looking back at its history, where it is now, and where it is headed. The festival consists of panels, screenings, and events where attendees and leaders in the TV industry talk, watch, and experience television together as one community. Heading into our 6th Season, June 8 - 11, 2017, ATX focuses on TV’s past, current, and upcoming series through screening Q&As and panel discussions. This Programming ranges from never picked up pilots, reunions, current series going into a new season, to premiering content from upfronts, summer, or online. Panel discussions can be 1:1 conversations, featuring a single show, or focus on a topic that pulls professionals from a variety of shows and features such topics as the ratings system, series finales, and testing/focus groups. And with 50/50 split between fan and industry, ATX Television Festival is a unique festival event that stems from a true celebration of the medium. Check out all the awesome Programming we have planned and learn more about Badges & Tickets. As always, this event is free and open to both ATX attendees and non-attendees (general public/community members)! Don't for get to take your picture in the Smallest Park in Texas! Enjoy some fantastic live music - lineup and details below! We're so excited you'll be joining us for Parks & Recreation and we can't wait to say hi! Settle in friends - it's time to sit back, relax and enjoy! It's just not a Parks & Recreation celebration without Li'l Sebastian, so our friends at the Austin Film Commission are teaming up with Minis & Friends, a nonprofit that takes specially trained miniature horses to visit people of all ages with special needs, to make sure we have minis at our event. Minis & Friends will have a selfie booth onsite, where you're able to take a selfie with one of their minis for a $5 donation to their organization. Jazz Mills (Topgirl Productions) and Stephanie Hunt (Friday Night Lights, Californication, Your Family or Mine) are long time friends from the Austin music scene who love to sing in harmony with each other. They started singing together in local bands Tbird and The Breaks and Cowboy and Indian, and since then collaborate in all aspects of life. Dr. Joe is a piano rock and roll outfit out of Austin, TX with the southern funk of Leon Russell and the soulful howl of Ray Charles. Front man Joe Sparacino grew up playing gospel piano in the rural midwest. In an attempt to recreate that elevated experience, he drags a 300 pound piano to every show he and his band plays. What results is a joyful noise. Trent Langley is a solo artist/singer-songwriter out of Austin, TX. Prominately known for his monthly music releases, he not only writes all of his music but records & produces all of his work in his private home studio. His music varies from genre to genre with each release, emphasizing his love for all styles of music. His debut single, Dance Out the Door was featured in the "Solstice Presents Top 25 Singles of 2016” and more recently, he was a featured performer at the Norman Music Festival in Norman, Oklahoma. This event is free and open to both ATX attendees and the general public. There will be no Single Tickets available for this event (because free), and you don't need to have your ATX Badge or Wristband to attend. However, as always, please note admission to all ATX events is subject to venue capacity. There will be no seating provided at the event, so don't forget to bring a blanket so you can comfortably watch the screening. Our lovely friends at Jo's Coffee will have food and drinks (both alcoholic and non-alcoholic) available for purchase. We'll also have Steel City Pops there for all your gourmet pop needs! ATX Fest Protocol: If you spot an ATX Panelist in the wild, remember, no crowding, and any asking for signatures or photos should be kept to a minimum. If you engage anyone, Panelist or attendee, in a disrespectful or inappropriate manner, we reserve the right to remove you without re-entry.